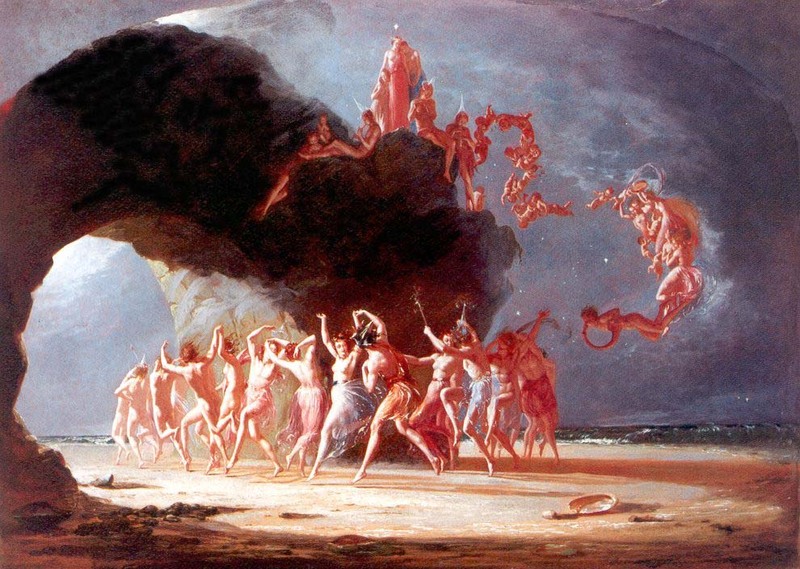 Hieronymus Bosch and Richard Dadd: kindred spirits? Some painters – Hieronymus Bosch and Arcimboldo, for example – have mature styles which stand out on their own, no other artist (until the twentieth century, at least) coming close. Walk into a room in a gallery, and you can identify one of those mature works from a distance, the style is so uniquely distinctive. Some have asked me if there is anyone with a style comparable to Bosch, apart from the various imitators of his style. 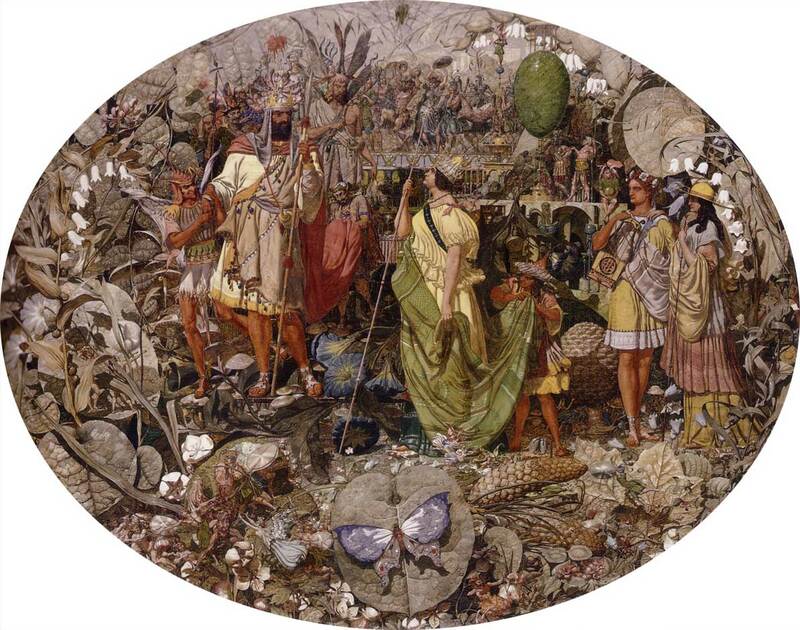 The only artist who springs to mind is Richard Dadd (1817-1886). Dadd was born in Chatham, Kent, England, at a time when it was a major Royal Naval Dockyard. He showed aptitude at school, so at the age of 20 was admitted to the schools of the Royal Academy of Arts in London. He won the medal for life drawing there in 1840, and progressed to being an important and popular painter and illustrator. Together with William Powell Frith, Augustus Egg, and others, he founded (and led) a group known as The Clique. In late 1842, he worked as the draftsman and artist on an expedition through Europe to Greece, Turkey, and the Middle East. However when he was travelling on the River Nile towards the end of that expedition, he was thought to have been affected by sunstroke, as he suffered from delusions and became increasingly violent. He also believed that he was under the influence of the Egyptian god Osiris. The following year his mental condition continued, and he was sent to the country to recover. Unfortunately his delusions now told him that his father was the Devil, and in August Dadd murdered his father, and fled to France. While trying to travel to Paris, he tried to kill another person with a razor, was arrested, and confessed to murdering his father. He was then committed, for the rest of his life, to the care of psychiatric hospitals, notably Bethlem (popularly known as Bedlam), and then Broadmoor, newly established for the ‘criminally insane’. Here his enlightened carers allowed him to continue painting, and he created some of his greatest works. He died in Broadmoor Hospital. Richard Dadd (1817–1886), Titania Sleeping (c 1841), oil on canvas, 59.7 x 77.5 cm, Private collection. Wikimedia Commons. In addition to fairly conventional painting and illustration, Dadd was one of several painters who produced ‘fairy’ works. Others include Robert Huskisson, Joseph Noel Paton, and Daniel Maclise, whose works were shown at the Royal Academy, and became quite popular around 1850. Dadd’s Titania Sleeping (c 1841) is fairly typical of the genre, with its intricately detailed human-like creatures. These have some similarities with Bosch’s figures, but are more closely related to one another. Richard Dadd (1817–1886), Come unto These Yellow Sands (1842), oil on canvas, 55.2 x 77.5 cm, Private collection. Wikimedia Commons. Come unto These Yellow Sands (1842) shows how some of these fairy paintings became even more spectacular, but remained quite distinct from those of Bosch. Here the figures are also much more human in appearance. Away from the fairies, Dadd still tended to load his canvases with a lot of figures, and to make some of them appear more odd. 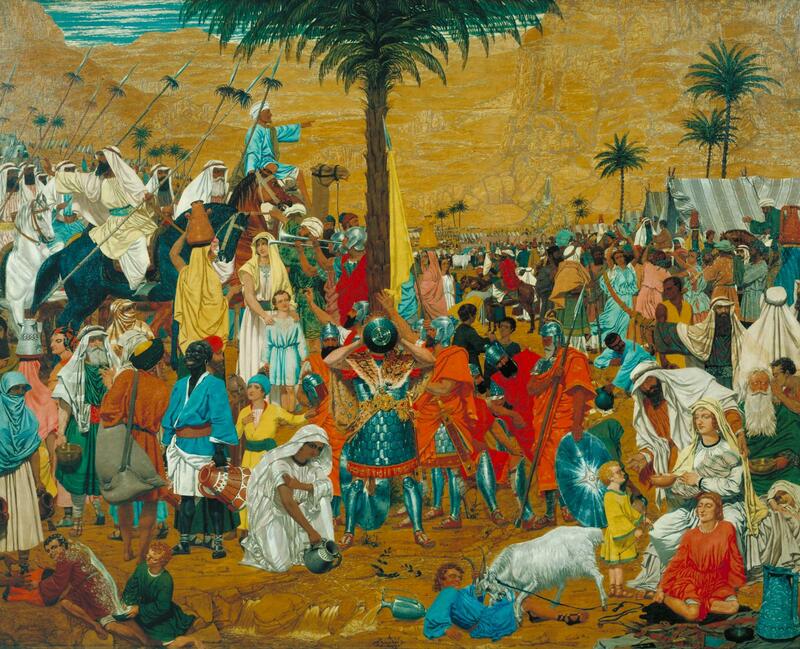 The Flight out of Egypt (1849-50) shows this well, and was painted when he was in Bethlem Hospital. 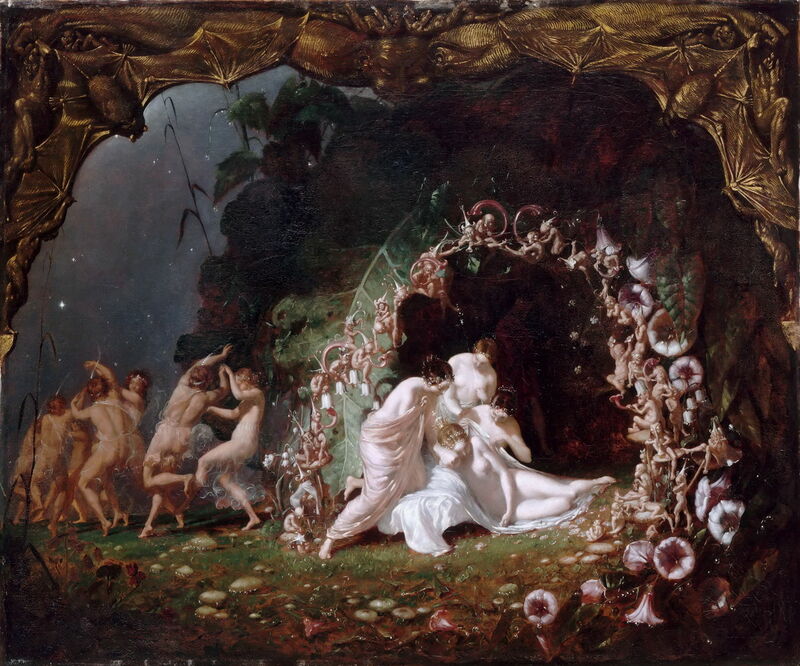 After about 1850, some of his canvases moved away from regular ‘fairy’ paintings to a quite distinctive style which is more closely related to Bosch, as shown in his Contradiction: Oberon and Titania (1854-8). 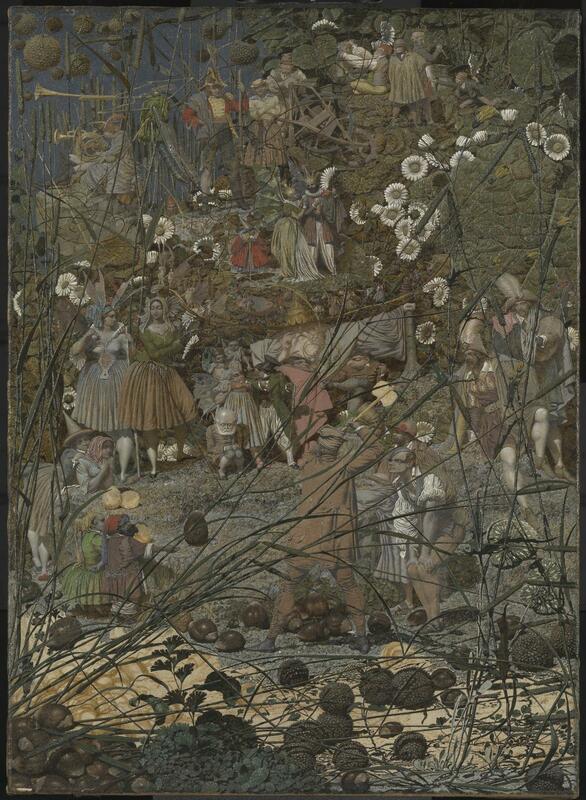 A number of ‘normal’ figures are shown at normal size across the middle of the painting, but around them, painted more in a grisaille, is a dense mixture of natural objects and creatures, and some more bizarre ones. This culminated in his masterpiece, The Fairy Feller’s Master-Stroke (1855-64), in which a man wields a golden axe. Around him plants and people are shown in several different scales, and objects are starting to transform in unexpected ways. Given the differences in era and painting style, I think that there is much in common between this work and the mature paintings of Hieronymus Bosch. It would have been fascinating had they been able to discuss their art together. Posted in General, Painting and tagged Bosch, Dadd, painting. Bookmark the permalink.